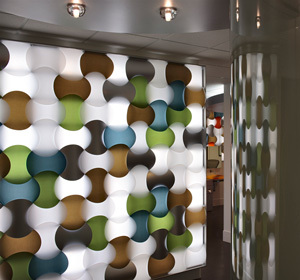 Linda Sale’s task was to design an environment that was playful, colorful, and sophisticated, but also one that could meet the logistical demands of a busy orthodontic practice. The result is a space as dazzling as the smiles created there. Competition is heavy in the field of orthodontics, and first impressions are important. Potential patients begin to form their opinion of a practice the moment they walk through the front door. South Surrey Smiles patient demographic covers a broad range in age, but their core client base is early teen to about twenty years old. To appeal to this demographic, Sale and her client decided on a hip and contemporary vibe. The waiting area at South Surrey Smiles has the casual and relaxed feel of a lounge with comfortable seating and a custom latte bar. The treatments areas have an open and airy feel with beautiful views of the outdoor gardens; yet still maintain the patient’s privacy. It is only natural that some of the patients bring a bit of anxiety with them when they walk through the doors for the first time. Sale based her design on a clean neutral pallet to help relax the patients, and then added a bit of strategically placed color to add a whimsical element to the space. 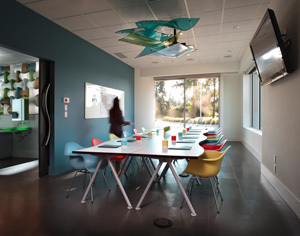 However, those color elements served a purpose other than just whimsy. Orthodontic care requires multiple visits over the course of treatment. Because patients often return monthly, they become familiar with the routine. 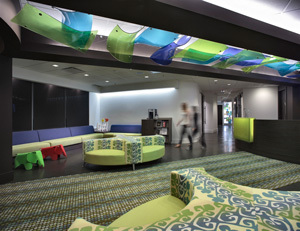 The client was looking for a self-serve environment, and Sale turned to color to help. When patients sign in at South Surrey Smiles, they are directed to either the "Orange" or the "Green" on-deck area where they can brush, floss, and relax before their treatment. These on-deck areas are easily identified through the incorporation of custom colored area rugs, wall vinyl, and seating. Neo-Metro sinks played a significant role in the wayfinding process. As patients walk down the hall, the first thing that captures their attention is the Neo-Metro wall mounted Ebb sink made from Cast Resin with color to match the patients’ assigned on-deck area. LED lighting illuminates the sink decks providing a deep ambient glow that is bold, strong and begs for attention. The sinks, while certainly beautiful to look at, have an even bigger role to play. Linda Sale feels that one of the most important elements when designing a space in healthcare is function -- for both the caregiver and the staff. To accomplish that Linda Sale interviews the doctors as well as the staff members to ensure her design allows them to work at maximum efficiency. Another essential element that must be considered is hygiene. Dental offices have to be hygienically treated every day, and Neo-Metro’s wall mounted sinks, the heavy duty stainless steel Ebb basin with its smooth, clean elements, and wall mount faucet, makes it easy to keep the on-deck areas clean and germ free. 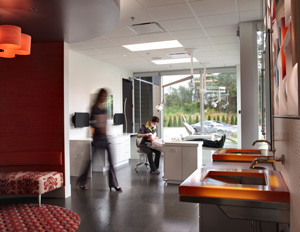 We think Linda Sale at Linda Sale Interior Design did a stunning job at South Surrey Smiles, but we are not the only ones who think so. This project earned her first place at the 14th Annual Northwest Design Awards Competition in the Small Design Firm Luminary Category. More images of South Surrey Smiles and Linda Sale’s other work can be found on her website.